British Libraries Case Study: Can Museums with shrinking budgets learn from Library Advocacy Efforts? Government cuts in the United Kingdom are beginning to hit the arts but other areas within the public sector are also taking a beating. In London, many neighborhoods are losing libraries: Croyton will lose six libraries, Barking and Deganham will lose five, and Hounslow, the borough next to mine, will lose eight. Libraries scheduled for closure are not necessarily the least used and many of these libraries serve upwards of 50,000 visits annually. For many Londoners (myself included), this is a catastrophe. But some communities have not been taking the news without a fight. When they learned of their libraries plan to close, The friends of Stony Stratford Library in Milton Keynes started a campaign to show how important the library was to the community. Called “Wot no books?” their grassroots efforts started with a Facebook and email call from a community member asking everyone she knew to take out the maximum number of books allowed on their card (usually 15) with the goal of emptying the library of all its resources by the end of January. 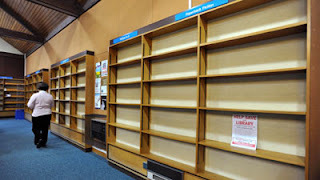 The librarians supported to campaign and were please to be checking out up to 380 books an hour, although they admit that re-shelving when the books are returned will be a challenge. The librarians even arranged that the last book checked out would be Mary Norton’s The Borrowers. The community succeeded and shelves were emptied and have now had a really thorough cleaning. The story has been picked up by press all over the world including the United States, Australia and New Zealand and is being replicated by libraries throughout the United Kingdom. The BBC covered the story in the UK and flyers were made available for those who wanted to support the effort. The current economy puts libraries and museums in the position of articulating and evaluating their worth to the community and supporting or launching campaigns to keep or raise public and private funding. But how deep is the problem and it is uniform across institutions? How are libraries measuring their impact within their communities and how organized are their communication efforts? Answering these questions has been a challenge as it has not been clearly articulated how the decision was made about which London libraries to close. In speaking with the senior librarian at the main branch of the Ealing Library (my main library), she explained that she has not yet heard about how cuts will affect our individual libraries. She expects that the leaders at the Borough level will be making the decisions and that these will be pushed down with little input from the community or libraries effected. 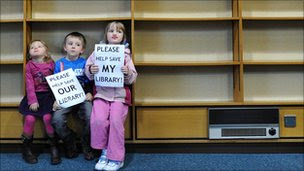 A review of library services has been announced, looking at buildings and services to search for savings. Ealing seems to have fared better than most boroughs with no closures to date. Cuts made thus far have been in personnel with open positions frozen and not filled. The senior librarian was hesitant to discuss it further because she explained that the Council is very strict about messaging and librarians are not encouraged to give their opinions. All the same, the Ealing Libraries are doing what they can to show how the community values their services. Sponsored by the Campaign for the Book and the Ealing Alliance for Public Services, a “Read-In” was held on a recent Saturday. Participants were encouraged to bring or borrow a favorite book and read in the library, participate in discussions about their favorite work and the importance of libraries, and show how much libraries are valued in the community. The community can voice their support of an organization through concrete actions, which decrease their feelings of helplessness and deepen their commitment to that organization. The network of friends for an organization can grow exponentially as the community galvanizes around a cause. As a result of the Stony Stratford campaign the library friends and Facebook groups now have hundreds of members. Significant advocacy efforts can become big news stories, which can be used to show public support and make a case of the importance of public services to a community. An organization can gather statistics related to its importance in the community to use for further advocacy or fundraising efforts. As discussed in previous blog entries, museums and libraries are doing amazing and creative work in our communities. With cuts in public funding affecting everyone, the need for innovative partnerships between both types of institutions will only continue and force us to become equally creative about mobilizing our users to show and quantify their support. I am following up on my previous CAM post to talk about an interesting session I attended. 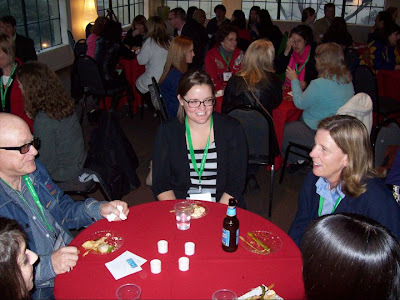 "Beyond the Didactic - Engaging Visitors in a Social Media World." piqued my interest. The first panelist was Maria Gilbert from the J. Paul Getty Museum. At the Getty they participate in all the expected forms of social media but had a few interesting ways to use them to provide additional depth and engage the public. She showed how they are using Flickr to juxtapose master's work with visitor's work and show non Getty photos of historic sites to illustrate the context of a given artwork or artifact. Sorel Denholtz is a Social Web Strategist who helped the Cal Academy use social media to engage a new audience and drive attendance to their Nightlife program. These strategies were less about moving "beyond the didactic" and more about connecting to visitors and social marketing. Nightlife is a weekly event aimed at a 21 - 35 year old crowd and features science programing, DJ performances, and drinking all within the Cal Academy. They identified 6 visitors that would become Nightlife Insiders and were given free tickets and special treatment in exchange for regular Facebook posts. The relationship was totally transparent and it helped Nightlife FaceBook page gather 19,000 fans (as compared to the 20,000 Cal Academy fans) and become a huge success. Lisa Sasaki from The Japanese American National Museum described how their institution was using thing like QR codes and Facebook to provide more depth to an exhibit and also to be relevant to a younger generation. She pointed out the value of having more than one voice on the museum's social media and reinforced the need to have the posts or tweets adapted to fit the different platforms. I left feeling excited by the ways these institutions were using social media but was a bit disappointed to see that these online resources were impossible to find in the case of the Getty, and not very heavily used in the case of JANM. The NightLife Facebook page was impressive in terms of the level of activity on the site and the way they are making themselves relevant to a traditionally hard to reach audience. It will be interesting to see if other institutions can use this social marketing approach as effectively to connect to specific audiences. Ron Davis, Elena Merlino and I took a trip to Pasadena for the California Association of Museums conference last week. This year the conference had 486 attendees from a wide range of California Museums. It was a great opportunity to talk with this diverse group ranged from a single room schoolhouse museum, the Reagan Library, the Charles Paddock Zoo in Atascadero, to The California Academy of Science. The one thing that impressed me in all my conversations was the passion and unique interests of this group of museum professionals. In addition to the conference we had a chance to visit a few local museums. One highlight was out trip to kidspace. The museum is a series of small buildings linked by outdoor exhibit spaces. This arrangement is similar to the Bay Area Discovery Museum and I have to say it is a great way to organize a Children's Museum (especially in a place with weather as nice as Pasadena.) 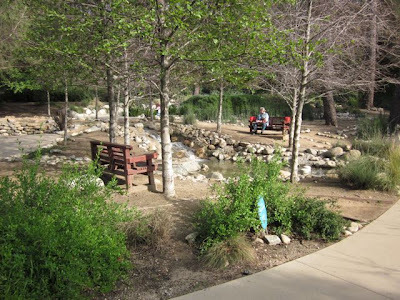 A few highlights at kidspace were the 2 large indoor climbers, the Nature Exchange, and the Interpretive Arroyo which is integrated into the adjacent hillside and garden. Of all the exhibits it was Trike Tracks that got us the most excited. The exhibit is as simple as a stamped concrete path that defines a road, a few road signs, a variety of trikes, and helmets for the kids. As you can imagine all sorts of fun emerges as kids (and exhibit designers) race and negotiate the course. The stream is nicely integrated into the hillside and garden. Note that they offer places to sit and enjoy it. Lookout!!! 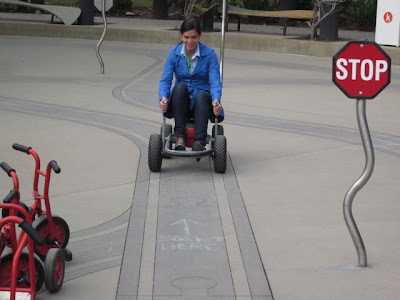 Gyroscope exhibit designer Elena Merlino breaks all the rules by riding the wrong way without a helmet . 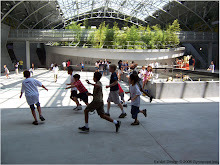 Maeryta Medrano, AIA LEED AP, President, Gyroscope, Inc. I've been interested in the convergence of museums and libraries since my grad school days at UC Berkeley. Some of the greatest examples can be found in Greek and Roman architecture where a museum and library were almost always paired together, often in conjunction with the forum, marketplace, and bath houses. 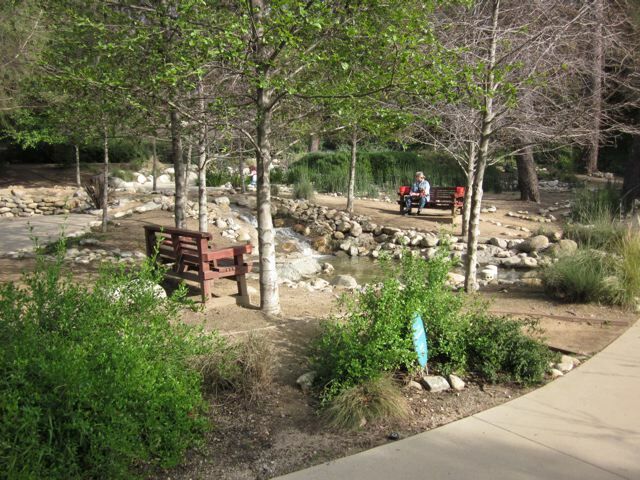 These public places functioned together as the hub of civic life and a community gathering place. Libraries, according to this article are seeing significant growth over the last few years, even though digitization has been replacing physical books. This statistic from the article is telling- "from 2002 to 2008 their ranks rebounded astonishingly, rising 7 percent among adults and 9 percent, the biggest growth, among teens, according to the National Endowment for the Arts. Moreover, public libraries in the United States have seen record usage, up 23 percent between 2006 and 2009, according to the American Library Association (ALA), partly due to the job-seeking resources they offer. So the future of libraries in a computerized world is potentially bright." Some libraries, such as our client in Rancho Cucamonga, have taken it one step further by offering a place to record oral histories and activities for young children within the stacks. I know if my local library had these amenities, my family would take advantage of them and spend even more time there. As it is, we go almost every Saturday morning to check out books, videos, and sometimes magazines. This summer, while in London on business, I spent hours at the British Library where I not only checked out a cool exhibit on maps, but also had an excellent lunch. Situated not too far from the stacks at a comfy couch with free wi-fi access, I emailed design ideas back to the office while enjoying a latte and a delicious chocolate torte. What's not to like? I'm hoping other libraries will pick up on the trend to include more programming, amenities, food, coffee and comfortable seating. I would argue this trend is important for museums as well. Although many do offer some visitor amenities, the right mix of programming, technology, books, cool architecture and great coffee is a sure way to make patrons feel comfortable and engaged. See the article below for the full story and reader’s comments.